Home NEWS Sporadic demonstrations erupt in Thika, Kiambu over Supreme Court’s “exposé”. Sporadic demonstrations erupt in Thika, Kiambu over Supreme Court’s “exposé”. 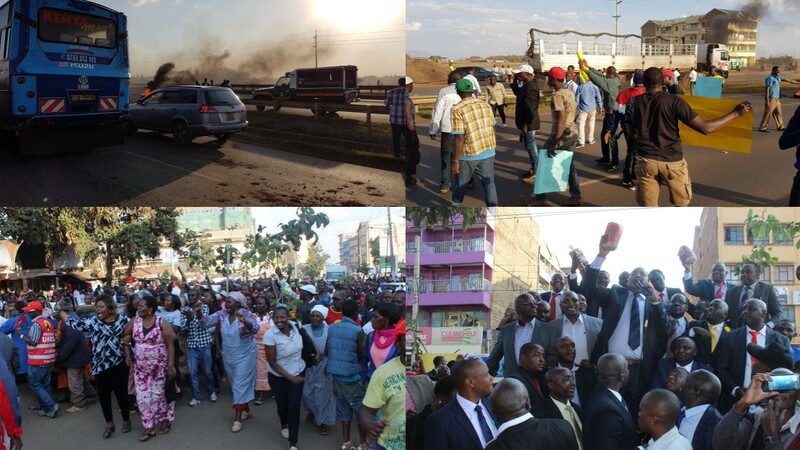 A photo collage of sections of the demonstrations that erupted in Thika and Kiambu towns after the Supreme Court 'expose' yesterday. Sporadic demonstrations by Jubilee supporters broke out in Nairobi, Nakuru, Thika, Kiambu, Kikuyu, Nyeri, Karatina, Limuru and Eldoret towns on Tuesday paralysing business for hours as the news of some ‘clandestine’ association between a section of the Supreme Court judges and lawyers/confidantes of presidential election petitioner Raila Odinga spread like bush fire. In Thika Town, protesters waving twigs barricaded parts of Thika-Garissa Highway and lit bonfires on the busy Thika superhighway, blocking transport and interfering with the smooth flow of traffic for some hours. Police were forced to shoot in the air to scare away the protestors for order to prevail. They argued that the court would have instead ordered for a recount to ascertain the real winner in the August 8 election. “We will continue these protests until Kenyatta is sworn in for a second term!” one of the protestors threatened. In Kiambu town, Governor Ferdinand Waititu and all the 92 county MCAs joined angry protestors who were demonstrating on the ton’s streets. The governor told the protestors that they were not ready to allow for a ‘NUSU-MKATE’ government as schemed by the opposition, warning them not to take Jubilee’s silence for granted. Waititu threatened to rally Kiambu residents to camp at the Supreme Court today to hear the full ruling that nullified Uhuru's victory. “At no terms will we allow them to rob us our victory. We are ready for you and your evil scheme. We will only respect the Supreme Court ruling that called for a rerun of the presidential election. We will go to the ballot on the 17th of October as directed by the IEBC and reaffirm President Uhuru’s victory. Hii mchezo ingine yao hatutakubali!” said Gov. Waititu. On Tuesday, Kenyans woke up to the news of a petition filed by Derrick Malika Ngumu, the executive director of Mombasa-based Angaza Empowerment Network, calling for investigations and removal of Deputy Chief Justice Philomena Mwilu and Justice Isaac Lenaola. The petitioner’s affidavit said he had evidence the two held clandestine meetings and exchanged lengthy phone calls and text messages with lawyers and confidantes of presidential election petitioner Raila Odinga. He named lawyer James Orengo and senators Moses Wetang’ula and Amos Wako as among those who interacted with the judges while the petition hearing was ongoing. Yesterday, a defiant Maraga said the Judiciary as an arm of government will not allow the Executive or the Legislature to dictate how courts will discharge their duties, adding that he was ready to “pay the ultimate price” to protect the Constitution. He said the Judiciary has been assailed, threatened and reviled by politicians and on social media. “If the leaders are tired of having a strong and independent Judiciary, they should call a referendum and abolish it altogether,” he said after chairing a JSC meeting. Maraga said individual judges, particularly of the Supreme Court, and other judicial officers and staff, have been attacked, threatened and negatively profiled on social media. “They have also threatened the Judiciary, promising ‘to cut it down to size’ and ‘teach us a lesson’. These attacks are denigrating, demeaning and degrading and are meant to intimidate, threaten and cow the institution and individual judges, but we are prepared to pay the ultimate price to protect the rule of law,” Maraga said. Today the court will issue a detailed and complete judgment on the election petition filed by NASA flagbearer Raila Odinga.